Your child is a one kid army. When imaginary bad guys come knocking on the door, they’d better watch out! You know that your child is ready to go full commando on their behinds and your little one is always practicing new fighting moves just in case pretend ninjas invade your home. Perhaps it’s time you helped take your child’s combat skills to the next level! We’re not talking about outfitting your little one with anything dangerous, of course. We’re talking about equipping him with this awesome toy weapon set, which will help him dispatch evil bad guys with ease (even ones of the ninja varieties). 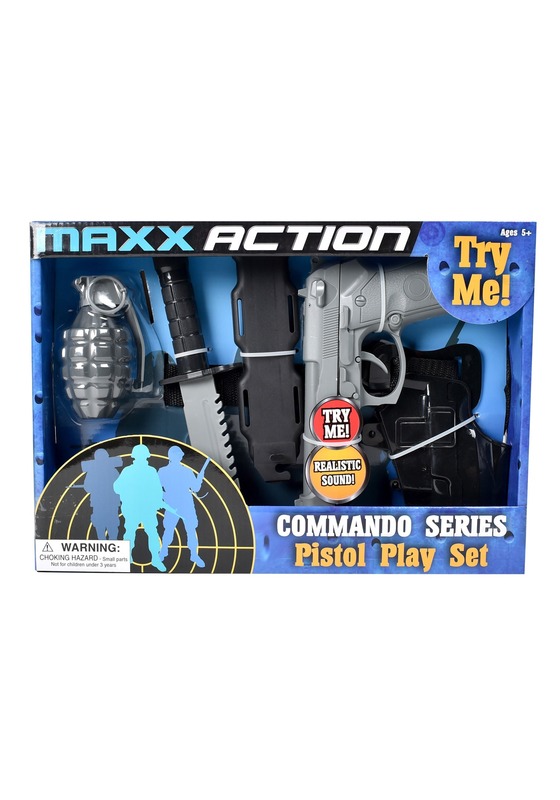 This Maxx Action Pistol Play Set is part of the Commando Series. That means it’s only for kids who are ready to become full-fledged commandos! It comes with a toy pistol that makes sounds with the pull of the trigger. It comes with a handy holster that you can place the toy gun inside of. It also comes with a toy knife with a matching sheath. Finally, for those really intense battles against imaginary bad guys, your child can use the toy grenade. The toy grenade is made of a molded plastic, but it’s sure to cause a pretend explosion that will take down tons of pretend ninjas. Your child will be able to take care of plenty of pretend bad guys when they use this Maxx Action weapon kit!